16 Congratulations to Our Spring 2013 Graduates! The National Radio Talent System in collaboration with the Hubbard Radio Institute in Ellensburg, Washington selected Tia Johnson, Mass Communication major, to attend a 10 day radio bootcamp. She was competitively selected to attend the institute with 25 selected students. The program will take place at University of Central Washington where the students will have the opportunity to meet with radio professionals. The program will attract, coach, teach, and train the students for the radio industry. The program is scheduled for June 13-22, 2016. The Department of Languages & Communications congratulates our very own Jeaiza Quiñones for winning the title of Miss PVAMU 2016-2017. Jeaiza Quiñones is a junior, majoring in English and minoring in Music. She is from Norfolk, Virginia by way of the U.S. Virgin Islands- St. Croix. Through her platform #HelloQueen, Jeaiza is striving to bring awareness to women’s issues on campus and in the community. Congrats Jeaiza! We look forward to watching your reign next year! Other conference attendees included Nia Shy (senior English major), Kennye Osunye (senior Biology major), Mason Chandler (sophomore English major), Jasmine Westmoreland (senior English major), and Jessica Westmoreland (junior Biology major). The Departments of Languages and Communication and Music and Theater are proud to host a guest lecture and performance by Dr. E. Patrick Johnson, Carlos Montezuma Professor, Department of Performance Studies and African American Studies and Director of Graduate Studies, Department of Performance Studies at Northwestern University. Dr. Johnson will be the guest lecturer in COMM 4523 Communication Theory on April 1, 2015 at 6:00PM. He will discuss theories of communication, the power of oral history and the rigors of performative discourse. On April 2, 2015 at 10:30am in DRAM 4313 Acting Styles Dr. Johnson will discuss how oral histories are performed on stage and embodied by actors. Dr. Johnson will close his visit with a performance of “Pouring Tea” a dramatic reading based on the oral histories collected in Johnson’s book Sweet Tea: Black Gay Men of the South An Oral History on April 2, 2015 at 6:00pm in Becton Auditorium, A.I. Thomas Building. His performance is open to the campus community and the public. Download the flyer for the event here. For more information contact the Department of Languages and Communication. The PVAMU Speech and Debate team travelled to the University of Louisiana-Lafayette this past weekend (Feb 5th-7th) to compete in the annual Mardi Gras Swing invitational tournament. The team placed 3rd overall in Debate Sweep-stakes. Kawana Scott, Senior Community Health Major, was a semi-finalist in International Public Debate. The team is preparing this week for a Public De-bate with Texas Southern University on February 15th at the Houston Muse-um of African American Culture. The event is free and open to the public. Please come out and support the team at this event, or the weekend of February 20-22 when they host other speech and debate programs from the region on campus for an American Forensics Association qualifying tournament. Students and faculty are encouraged to come and watch the team compete in a wide array of events. If you have any questions, or would like to join the team, please con-tact Patrick Luster at 936-261-3737 or at paluster@pvamu.edu. Communication Majors and Lambda Pi Eta members Chase Brown (Senior) and Joielle Bivins (Senior) were joined by Communication Majors Sarah Jordon (Senior) and Vince Balkcom (Junior) at the National Communication Association convention. The convention theme was “The Presence of Our Past(s): NCA at 100.” Students had the opportunity to attend multiple panels, presentations, performances, and lectures delivered by a number of top scholars in Communication. The students also attended the graduate school fair and other events, including the African American Communication and Culture Division Business Meeting where they accepted Dr. Johnson’s award for Outstanding Book Chapter (Dr. Johnson was double booked, presenting research on a panel at the time of the meeting). Students rounded out their trip with the President’s Address and Awards where they witnessed Dr. Amber Johnson receiving the Golden Monograph Award, the highest research award in Communication. On Friday October 3rd the Languages and Communication department of Prairie View A& M University was visited by Emmy Award winning Senior Production Manager for ESPN Mr. Acie Wyatt. A graduate of Hampton University, Mr. Wyatt was able to bring a familiar perspective to the students and relate to the HBCU experience. Mr. Wyatt spent his time here talking to students about his professional journey and some of the hurdles he faced early on in his career. He shared samples of work he produced, and students were able to ask questions and also receive constructive feedback on projects they chose to share. Five communication majors from the department attended the 2014 Convention and Career Fair of the National Association of Black Journalists (NABJ) from July 30 to Aug. 3 in Boston. The students, all members of the university chapter of NABJ, included recent graduate Kemane Hagerman of Pearland, Amber Gradney of Beaumont, Taylor Woodson of Fort Worth, Denzel Speights of Houston, and Vince Balkcom of Elk Grove, California. They were accompanied by Communication Coordinator Lewis Smith. The convention was held at the Sheraton Boston Hotel and John B. Hynes Veterans Memorial Convention Center under the theme “Revolution to Evolution: Shaping Our Future.” It was attended by more than 2,100 journalists, media professionals and students. The convention was filled with notable businesses, networks, and people from the media, political, and entertainment worlds such as actor Omari Hardwick of the Starz series Power, E! News correspondent Alicia Quarles, Massachusetts Gov. Deval Patrick and renowned politician and diplomat Andrew Young. Woodson interviewed Hardwick about his first lead role in a series, writing and directing an episode and upcoming projects. Balkcom and Woodson had a chance to interview Harvard Law School professor Charles Olgetree and veteran broadcast journalist Ed Gordon. The five Prairie View students teamed up with PV alumnus Charles Williams, a New York-based CBS editor/producer, to shoot footage of various sessions and events. Dr. Dejun Liu, Associate Professor of Communication, and Dr. Baomei Lin, Lecturer of Chinese, accompanied 18 PVAMU students for a six-week intensive Chinese language study abroad opportunity with Xi’an International Studies University in Xi’an, China. This is the third consecutive summer for Dr. Liu and the first for Dr. Lin. Languages & Communication students Rochelle L. Vazquez (English) and Roger J. Thomas, III (Communication) were among those who attended. During their stay, students completed four courses: Listening Comprehension, Conversation, Pronunciation, and Chinese Painting and Calligraphy. They attended workshops on paper cutting and pottery making and savored art performances such as shadow-puppet shows. To further compliment their studies, they visited famous historic sites such as the Terri Cotta Warriors and the seven-hundred year old Xi’an Circumvallation City Wall and used their language skills to barter in the city market. When Holly Charles walked into the defense for her English M.A. thesis in 2013, she didn’t know what to expect. Her committee (Dr. Robert Kirschten, Dr. Clay Hooper, and Dr. DeLinda Marzette) asked tough questions about her creative work, Velvet, based on the women in her family. Then they advised her to get it published. Charles did just that, raising money from trusted family and friends by talking about her book and reading excerpts. She came to Prairie View A&M on March 20, 2014, as part of the Women’s History Month program, to give another book talk to an intimate group of students. “We don’t talk about common tragedies,” she explained. The traumas that befall so many — specifically, tragedies related to colorism — aren’t discussed, and prejudices continue to be passed down through the generations. Holly read “Stones,” a selection from Velvet about Ludie, whose dark, shiny skin causes not only insults but also physical assaults, to the hushed crowd, which then started opening up about their own experiences with family members who preferred lighter or darker skin tones. Velvet is available in print and ebook formats from Amazon and Barnes and Noble. A group of twelve students from the Communication Research course, COMM 4533, traveled to the “Doing Autoethnography Conference” at Angelo State University in San Angelo, Texas from February 27th-March 1st with Drs. Amber Johnson and Jennifer Erdely. Students attended workshops on Performance, Writing, Social Justice, and Ethics in Autoethnography. Image courtesy of American Program Bureau, Inc.
ESPN sportscaster Stephen A. Smith will be on campus February 8, 2014. It won’t be for the TSU and PVAMU basketball game, though we hope that he’ll make his way there. Instead, he is the keynote speaker for the Department of Languages and Communication’s inaugural Communication Week, February 3-6, 2014, and for the 2014 National HBCU Student News Media Conference, February 6-8, also hosted by the department and PVAMU. Amen Oyiboke-Osifo (’11), MA student at the University of Southern California. Communication coordinator Lewis Smith of the Department of Languages and Communication has been selected by the U.S. State Department to present a series of lectures to communication students, faculty, and journalists in Ghana from Aug. 12 to 17. Smith will speak on “Press Freedom: American Perspectives and the Significance of a Free and Vibrant Media” to several undergraduate audiences and lead a seminar for senior journalism students at the African University College of Communications in Accra. He will deliver a lecture also to practicing journalists at the International Press Center. Smith will travel from Accra to the northern city of Tamale to lead a symposium for students and faculty, and give a presentation to regional journalists on how the media best serve local economies and development. The State Department’s Bureau of International Information Programs is funding the trip and the U.S. Embassy in Ghana and the African University College of Communications are organizing the schedule of activities. Congratulations to Our Spring 2013 Graduates! Five students completed the Master of Arts in English. In Fall 2013, four are slated to teach dual-credit English III and IV courses in the Cy-Fair, Katy, and Tomball Independent School Districts. Eight students completed the Bachelor of Arts in English. Many plan to pursue teaching certification at the high school level, if not law school or other graduate studies. Twenty-two students completed the Bachelor of Arts in Communication. They have a diverse set of career plans — film, radio, public relations, student affairs, sports marketing, acting — and most have set their sights on a graduate degree in the next five years. from left-to-right: (rear row) Chelsea Daly, Ariel Henson, Katharine Brown, Atlanti’a McDonald; (middle row) Marissa Berry, De’Andria Bogney, Chelsea Dennis, Rachel Weathers; (seated at table) H. Samy Alim and Geneva Smitherman. On Thursday, April 11, 2013, a group of students enrolled in Dr. Terri Pantuso’s History of the English Language class attended the “Speaking While Black [or Brown]: Language and Race” symposium at the University of Texas at San Antonio. The students in attendance studied Articulate While Black: Barack Obama, Language and Race in the U.S. written by two of the featured speakers, Dr. H. Samy Alim and Dr. Geneva Smitherman. Dr. Alim is an Associate Professor in Educational Linguistics with courtesy appointments in Anthropology and Linguistics at Stanford University. His research interests and publications center on topics related to language, literacy, youth culture (particularly Hip Hop Culture) and critical language awareness for socially marginalized and linguistically profiled populations. PV students were thrilled to discuss with Dr. Alim his research on pedagogical linguistic practices as well as his work with artists such as Common. Dr. Smitherman is University Distinguished Professor Emerita, Department of English; Co-Founder, Core Faculty and former Acting Director of African American and African Studies; and Core Faculty of the African Studies Center at Michigan State University. She has authored, edited and co-edited over 15 books and monographs as well as over 125 articles and essays. Her publications focus on African American Language and language rights for disenfranchised communities in the U.S. and around the globe. PV students were honored to speak directly with Dr. Smitherman about their academic and lived experiences in her field of study. One student, Rachel Weathers, remarked to Dr. Smitherman that she has felt since middle school that Black English was a distinct language. When asked by Dr. Smitherman how she came to this understanding, Ms. Weathers replied, “I just feel it.” To this, Dr. Smitherman responded with a smile, fist bump, and remark to Ms. Weathers to “Keep on.” In addition to the book talk, students listened to panelists speak about research related to language and race on topics such as code-switching among middle-class African Americans, language and biraciality, and secondary teaching practices with brown and/or black students. The keynote address was delivered by Dr. John Baugh, Margaret Bush Wilson Professor in Arts & Sciences and Professor of Linguistics at Washington University in St. Louis and Professor Emeritus in English Linguistics at Stanford University. Dr. Baugh’s address focused on the linguistic consequences of slavery in the U.S. which is in keeping with his primary research throughout his career. Dr. Baugh’s work on the social stratification of linguistic behavior in multicultural and multilingual nations has been influential in both academia and public policy, and the students in attendance enjoyed speaking with him one-on-one regarding their own research and professional interests. Yes, that is the Eiffel Tower you see! 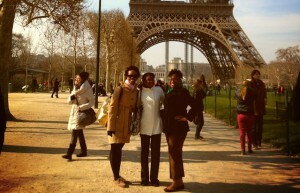 In March 2013, three Prairie View A&M students accompanied Dr. Toniesha Taylor, Assistant Professor of Communication, to the International Media Seminar in Paris. Communication majors BriAna Franklin and Tezya Jackson as well as finance and accounting major JaLacia Powell attended sessions featuring the editors of Time Magazine‘s European edition, a correspondent for CNN International, and noted journalists. When not networking with global professionals, the students attended the Notre Dame cathedral, cruised the River Seine, and navigated the French Metro system.